The brains behind Demijohn, a liquid deli in central Edinburgh, dishes on gooseberry gin, Italian cantinas, and the questionable merits of Scotland's national meal. I might have met Angus Ferguson in-person or set foot inside Demijohn – his charming shop in Edinburgh – if it hadn’t been for the elderflowers. Before departing for the UK in June, I bookmarked his shop for a visit during my short stay in the city. 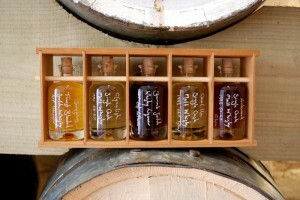 Demijohn’s website – which promises rows and rows of small-batch vinegars, oils, liqueurs, and cocktail mixes for the tasting – had me hatching a plan on the flight over as to how many bottles I could roll up in my clothes for return to the States. I dreamed of a home pantry kaleidoscope of multi-colored bottles – golden apricot brandy, ruby damson gin, and rosy strawberry vinegar. But the liquid gods were not smiling upon me that day in early July. I sauntered down Victoria Street, near the Grassmarket, only to arrive at Demijohn and find a handwritten note taped to the door: “Sorry, we’re out picking elderflowers. Please come back tomorrow!” Tomorrow? Tomorrow I would be gone! So I stood on my tiptoes and peered longingly through the window, eyeing the vats of vinegars and liqueurs with a longing akin to a child counting pennies outside a candy shop. Angus and his wife, Frances, describe Demijohn as “the world’s first liquid deli” and from my glimpses through the storefront window I could see why. Along the walls, over-sized glass bottles — the demijohns for which the shop derives its name — hold curious potions the color of plum, rust, and sunshine. Barrels of worn wood are affixed with handwritten labels for various whiskeys and smaller empty bottles of all sizes await a splash of this or a glug of that. It’s exactly what you’d imagine of an old apothecary shop and is a perfect fit in Edinburgh – a city pulsing with an eerie, mystical history and a vibrant, present-day counterculture. I eventually pulled myself away from Demijohn’s window and set out to enjoy the rest of Edinburgh, which I’ll delve into in more detail in my “Eat Like a Local” column later this month. But upon returning to the States, I caught up with Angus via phone to chat about Demijohn, the shop’s online ordering system (my lifesaver), and the first and last bites of his life. He also informed me that I attempted to visit the shop on one of the only two days a year that they close for picking. Just my luck, I suppose, but also an excellent excuse to go back for a second visit. And this time, if I arrive on elderflower day, I’m going picking right along with him. What is one of your first food memories? I can still remember, at age 10, having my first crab. We were in a place called St Peter Port in Guernsey. We’d all gone out as a family to the local restaurant after having sailed in on my father’s yacht. I remember my parents turning their noses up, because I’d chosen the most scary thing on the menu – the crab. And they looked at me and said, “There’s no way you’re gonna like that and you certainly won’t finish it.” Of course that was like waving a red rag at a bull. So, I thought, I’m definitely having that and I’m going to finish it whatever happens and that was it. I have eaten my way through a tonnage of shellfish ever since. Tell me a little about your background. Did you grow up in a food-loving family? I have a [military] background. My father was in the Royal Navy so we did a lot of traveling, especially when I was a child. I ended up living in places like New Zealand and Italy. But what I consider my home is southwest Scotland, in Galloway. I come from a farming family and one day I’ll end up back there but at the moment my wife and I live just north of Edinburgh. My mother is one of these people who very much kept the home and fed us all extraordinarily well. 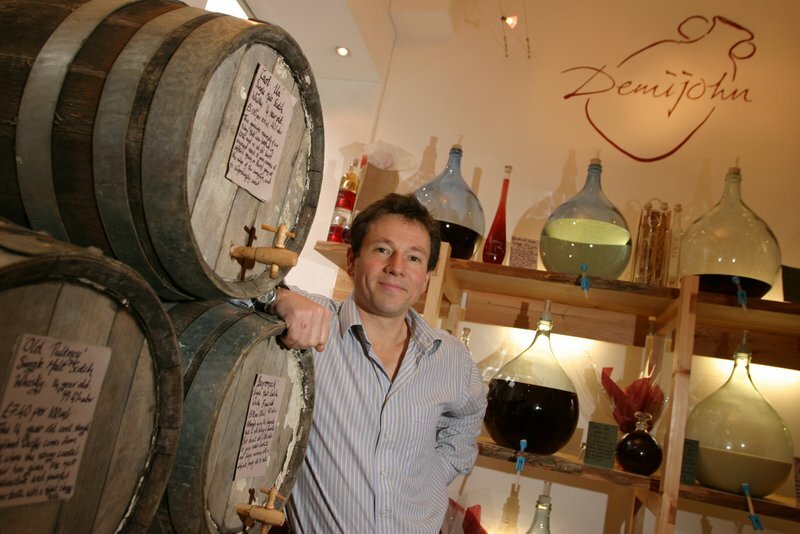 When did you open Demijohn? We actually started the original shop in Edinburgh, the one you saw on Victoria Street, in 2004. So we’ve been going at it for about eight years. This thing has just grown and grown to the point where we now have three major outlets – Edinburgh, Glasgow, and down in York – and then obviously online sales. We ship now, all over the world. Where did the idea for Demijohn come from? Then, I went off and joined the army for ten years. I was in the Black Watch, which is one of the Scottish infantry regiments. When I started thinking about coming out of the army – and this was in 2002 – my wife Frances and I looked back on our experiences together and one thing we’d done a lot of is traveling to eat. So, we started a plan around this cantina idea, but I very much loved different kinds of olive oils and things like that. How did you go about finding your first producers? One day [Frances and I] were at a dinner party with a mutual friend and we met a couple of retired P.E. teachers who had brought along a bottle of their handmade brammle scotch whiskey liqueur. We tried it and realized we had struck gold. [That moment] exposed an underworld of production in Britain. If there are people like them, we thought, then maybe there are more. So we went on a bit of a hunt. When we opened we only had about 20 lines [of product] and we had to repeat them around the shop. I was embarrassed because we had so little, but people never even noticed. They were too shocked by this new style of selling things – you go in, you try some things, you choose a bottle depending on how much you want, you have it filled up and you come back and get it filled back up for just the cost of a refill. How many producers do you work with? How do you find them? There’s a core of about 15 of them in total and they are just wonderful people. They range from people who are actually growing their own fruit and turning it into vinegar, etc., to people who started as hobbyists. The retired P.E. teachers are a great example of this. They make three of our products currently – raspberry vodka, brammle scotch whiskey liqueur, and a damson gin. We also have a lady, Rosie Sedgwick, who makes gin liqueurs down in Chester, England. But she’s retiring because she’s decided she’d rather be belly dancing and horse riding. It’s true! So, what we’ve managed to do is persuade her to give us the recipe and the P.E. teachers are going to be making her gooseberry gin with Scottish gooseberries. How involved are you in production? The day I came by you and Frances were out picking elderflowers. Is this typical? The elderflower vinegar is a great [exception]. If we didn’t close the shop and go pick the elderflowers we wouldn’t have that product. Our elderflower vinegar producer is this very nice lady who owns a fruit farm and has this family vinegar recipe. But the problem is they are busy farmers and they can’t go around picking all the time. We know the valley and the product so we’re willing to go ‘round and help. We almost deliberately now don’t make the products ourselves but rely on the expertise of the few chosen producers. They are very good at what they do. Tell me about Demijohn’s philosophy. What do you want visitors to take away from the experience? [Our products] are small amounts of a good thing and most of them are unique. Certainly there is a limited supply. I think the tasting element is so important when you get different batches and different products that just really need to be tried before you understand it. You take what are wonderful, local products, grown literally within miles of our shops and then you allow someone on the other side of the world to order them. I love the North America order that comes in and goes to their friend in France. I mean that’s just brilliant, isn’t it? I imagine this concept is also fairly environmentally friendly? Yes, we are low-impact. I always ask the question, “What we are about to do, could it be done in a way that is less harmful to the environment?” And if so, let’s just do it. The fact that we make customers come back with their bottles means that we have tiny tiny amounts of packaging. We produce, literally, one residential bins-worth of waste per week from our shops. That is unheard of in retail. Almost everything is reused or recycled. It is incredible how little we actually throw away. Let’s talk a little about Scottish cuisine, which tends to get a bad rap. Do you think that’s fair? I think there are two ways to answer this question. Scottish raw ingredients – salmon, shellfish, lamb, beef, pork – I would argue have an incredible name internationally for quality, in terms of their clean production. But I might agree with you that we have a long way to go to persuade people to actually love the Scottish national dishes – haggis, neeps, and tatties. In most places people think, “What the hell is that?” And they’re absolutely right. But I don’t think there’s any plan to change our national dish, and there shouldn’t be, because actually, what’s great about it is that no one else has anything quite like it. In the States, we’ve seen a resurgence of interest in eating locally. Do you see this happening in Edinburgh? At the moment, there is a huge movement toward buying local and understanding more about your food. Eight years ago, when we started Demijohn, this [local] concept was very new territory [in Edinburgh], but it’s why we did what we did. We thought it was very sensible for us to source locally, to find products that were made in a clean, fair way. I was absolutely determined to ensure the provenance of our products, to understand what they were made of, where they were made and who made them. If you could have one final dish before you die, what would it be? Oh, hmm. I think it would have to be spaghetti alle vongole. You know how sometimes food brings back memories of where you are in the world? Well, I was in Venice with Frances and we were out on Murano, which is known for its glassmaking. We were having an absolutely wonderful day and were desperately hungry at about 2 or 2:30 in the afternoon. We were also very aware that the Italians would soon close down their shops for a little kip. We found this one particular restaurant that was very busy outside, but was completely empty inside. We went in and the chef and a few of the waiters were just about to settle down to eat lunch at the back of the restaurant. We asked for the recommendation of the house and [the chef] got up and made us spaghetti with fresh clams – al vongole. He used fresh herbs and lots of olive oil and a bit of fresh Parmesan cheese. It was so simple and so delicious. Martha Miller is the food columnist for EthnoTraveler.